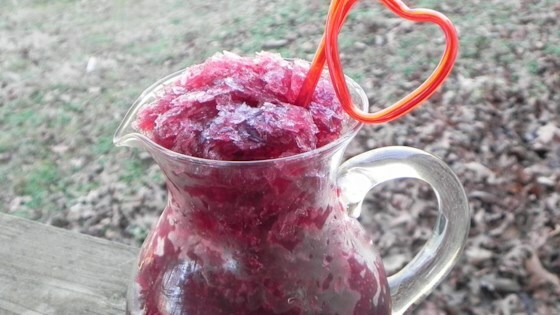 "A super easy grownup drink/dessert that's made with frozen rose and kind of framazing on a hot summer day. Get it in the freezer at lunch and it'll be ready in time for happy hour." Place strawberries, sugar, and water into blender and blend until the mixture is smooth. Pour mixture into a 9x13-inch baking pan; stir in the wine. Freeze, stirring once about halfway through, until mixture is slushy, 4 1/2 to 5 hours. Remove from freezer and stir to breakup the larger frozen clumps.